Dr. Schlesinger is an associate professor of clinical investigation at The Rockefeller University in New York and senior attending physician at The Rockefeller University Hospital. As a 17-year-old in high school, she worked in the lab of Dr. Ralph Steinman and the late Dr. Zanvil Cohn at Rockefeller, just a few years after they published their discovery of dendritic cells of the immune system. Today, Dr. Schlesinger continues to exploit the ability of dendritic cells to orchestrate the body’s immune response in order to develop new therapies for diseases ranging from cancer to HIV. She has led the clinical efforts to bring new HIV vaccine candidates developed at Rockefeller into the clinic. 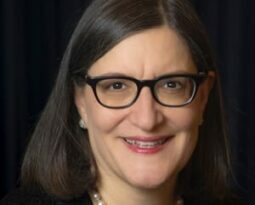 In addition to these responsibilities, she is the co-chair of the Rockefeller Hospital’s institutional review board and director of the clinical scholars training program and of the education and training programs at The Rockefeller University Center for Clinical and Translational Science. She also serves on the Medical Staff Executive Committee of the Rockefeller University Hospital. She graduated with honors from Wellesley College and obtained her medical degree from Rush Medical College in Chicago.